Gifts are always a great way to show appreciation to the special woman in your life. Whether we talk about an artfully-arranged flower bouquets, vintage necklaces or expensive clutches, there are plenty of gifts you can buy for your wife, girlfriend or, why not, your mother. Of course, it’s always great to know what she likes or wants – this will be an excellent opportunity to show you really care for her. If you are unsure of the best gift to choose, we compiled a list that will help you make the right choice for sure. If your special lady is in love with vintage or retro things, this necklace is going to be a great gift. Coming with a beautifully-made bottle accented by a white plastic daisy flower, the necklace features a teardrop pearl as well as a metallic butterfly, which makes the entire ensemble look especially feminine and adorable. We suggest choosing this gift not only for your girlfriend or wife, but also for your mother, daughter and work colleague – you cannot possibly go wrong with it. Is your wife addicted to cooking and doing housework? 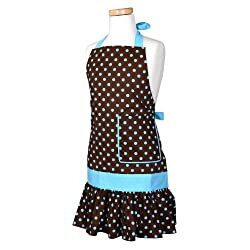 If so, this flirty apron is going to look awesome on her, especially due to the interesting combination of blue and chocolate brown. Designed to fit most silhouettes, this apron approaches a classic, but very feminine style that will undoubtedly flatter your special woman better than you could have imagined. If you can find a matching apron for you, then you will undoubtedly make her a pleasant surprise. If you are in search of a more unique gift, why don’t you choose this calligraphy set? Featuring a superb wooden box, the product includes several pens and ink pots, so that your special lady can create wonderful artwork every time she uses it. Every element of the set is carefully manufactured, which makes it even more appealing. 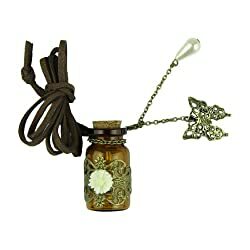 No matter how much she uses it, this item is going to have a very special place in her heart – and in her bedroom as well. Handbags are a woman’s best friend – not only can they garnish any outfit, but they are very practical, enabling your wife, mother or sister to keep all her essentials inside. 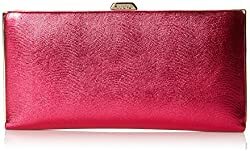 Colored in a bold shade of reddish pink, this clutch bag is very luxurious and can be worn with anything, from cocktail dresses to more casual outfits. Much to her delight, this bag is made from 100 percent leather, featuring synthetic lining that makes it even more appealing. Our tip? Never go for the most expensive gifts, unless it is a very special occasion going on. You can get a superb gift for less than $100 – a gift that will surely make the woman in your life very happy, particularly if you make sure it matches her tastes.